What size building or store do you need? When planning your retail store, the amount of selling space will be one of the most important factors in selecting a location. It can also be one of the most difficult to determine. As with any new business, most of your assumptions will be based on industry research and comparing similar stores operating in similar locations. To get an estimate on how much selling space your store must have, divide the planned sales volume by your industry's sales per square foot. Let's say you believe your proposed bookstore will do $250,000 per year in sales and market data says the average sales-per-square-foot in a bookstore is $150. By plugging those numbers into our formula, the amount of selling space you will need is approximately 1,666 square feet. But do you definitely need this much space? It depends. Too large of a space, and you may end up with a store that looks empty, and that's not very inviting to customers. Too small of a space will leave your shop looking cluttered, which in the case of a bookstore might create an interesting vibe, but for other stores would be a bad idea. Besides just choosing how much square footage you want, be sure you're also considering the location. A new strip mall seeking tenants might be offering cheaper-than-usual rents to fill space, but is it worth the risk to be one of the first stores in an untested location? Do your homework to determine whether the rest of the area is busy enough to drive traffic to your location. One area a lot of new companies don't consider is whether the area where they want to locate is properly zoned for the type of business they plan to open. Don't just assume that because an area is zoned commercial that you can put your lingerie store there. Check that the building's requirements meet your needs before falling in love with a location. This will save you headaches down the road. Besides selling space, remember to factor in extra square feet for an office area, stockroom, storage, and/or bathrooms. Although you may want room to grow, keep the size of the building close to your store's needs. And consider your neighbors. Are the other businesses in the shopping center you're eyeing too similar or too different from yours to help drive foot traffic? Finding that good mix can mean the difference between robust business and lackluster sales. Other than location, the most important thing to consider when choosing where to locate your retail business is how much space you can comfortably afford. When budgeting for rent and utilities, try to overestimate how much it's going to cost you, rather than underestimating. The last thing you want to worry about is whether you can bring in enough money just to pay the rent. Cash is king in retail and the biggest drainer of cash (after inventory) is rent. Remember, you are going to be in this space for the next five years, so don't; budget for today's prices, budget for what it will be five years from now. It is very easy to be "seduced" by the lure of a space that is twice what you need, but the same rent as another one you are conserving that is much smaller but the same rent. First, location trumps size. I would choose a smaller footprint to be in the right location every time. Location reduces your advertising costs. If you go off the beaten path, it will take a lot of advertising dollars to get people to find you. And you will quickly find that those dollars equal more than the rent savings. 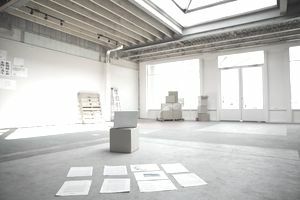 Second, as stated before, a larger space can look empty and then you are tempted to fill it - which again eats your cash. Every startup retailer believes his store will triple its business by the third year. So the extra space makes sense. Statistically, though, most retailers don't even get to profitability until the third year. And even if you don't fill the space, you still have to heat it, cool it, maintain it, insure it (you get the idea) which is an added expense. Consider that if your rent is triple net (like most are) you are paying taxes and insurance on the full square footage. So while the rent is cheaper, the added expenses for the triple net offset your savings. So consider the danger in getting too much space even if it is a bargain.